One thing I love most is design, crafts and art. I’ve been obsessed ever since I was at junior school and even ended up graduating from University with a Fashion Design Degree. Screen printing is one of my favourite design techniques as you can transform the simplest garment or item into something incredibly unique and funky. 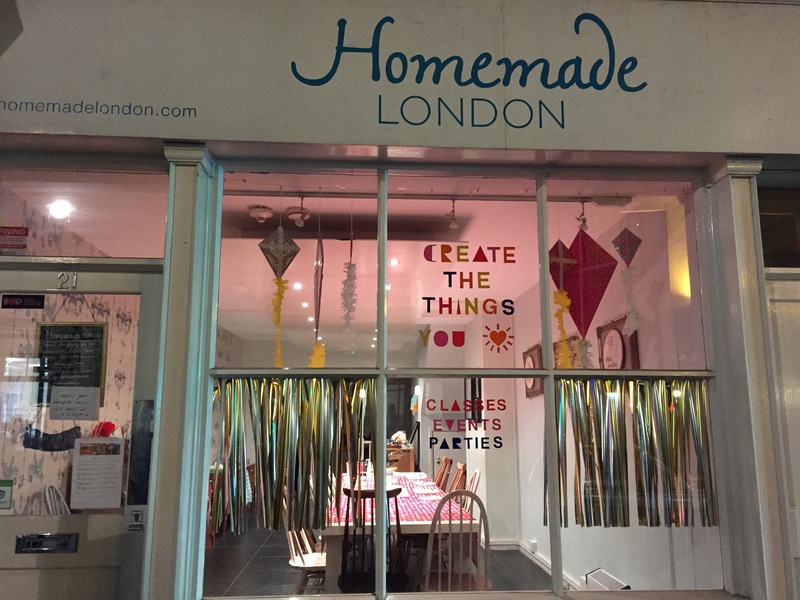 A hidden gem in the heart of London is ‘Homemade’ which runs a variety of craft and fashion workshops for all abilities. Learning a new skill is priceless and although I know how to screen print, I went along with a friend as it’s incredibly fun being creative. 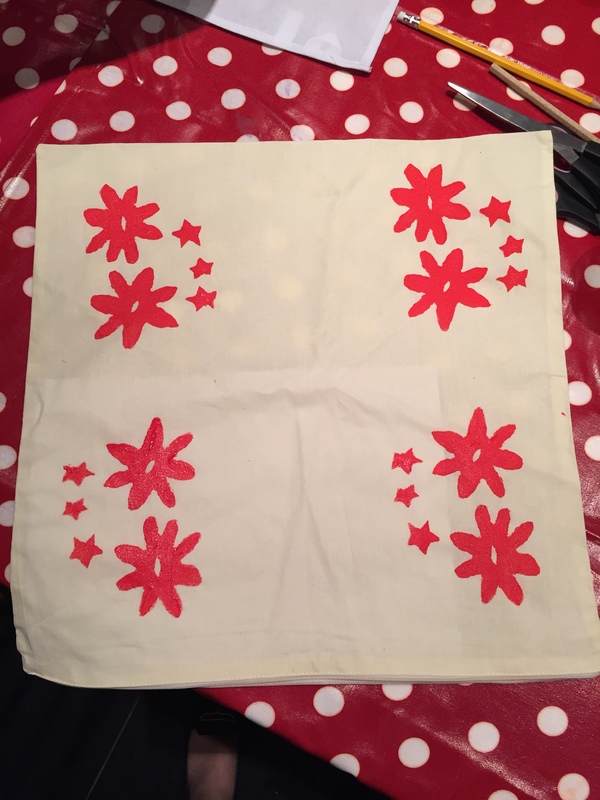 The golden rule for screen printing beginners is to keep it simple and then work your way up. The process which I’ll explain below is an inexpensive method for doing this at home. 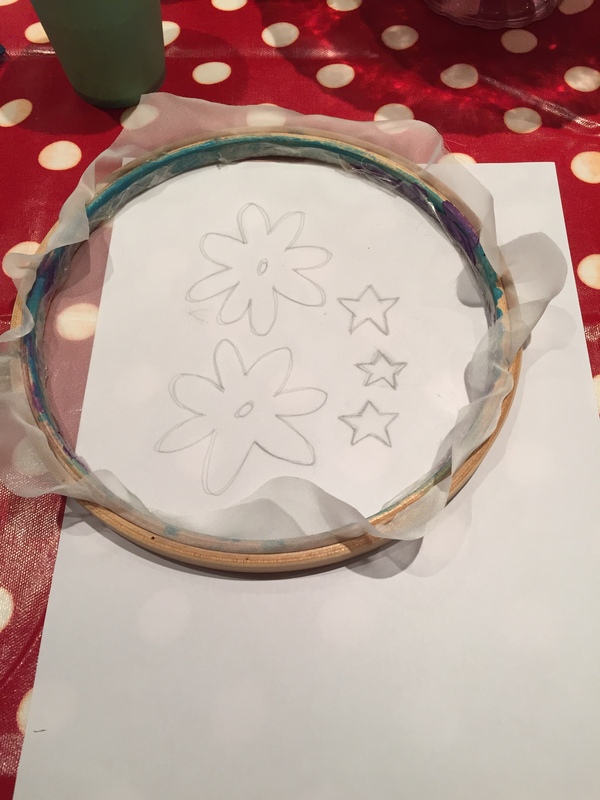 Firstly using a piece of organza fabric, stretch this over an embroidery hoop. Most haberdasheries have hoops for around £3. You can use fabrics like polyester, nylon or silk as long as it’s thin and slightly mesh like. Make sure that it’s evenly stretchy within the hoop. You can also use double sided sticky tape to ensure it’s completely stuck in place. Choose a design. You can either trace or free hand draw this onto a piece of paper. Once you’re happy, draw this onto your organza fabric. Ideally your design should be at least 1-2inches away from the edge of the hoop. With my design, I did a combination of free hand drawing and traced a shape that I had seen. 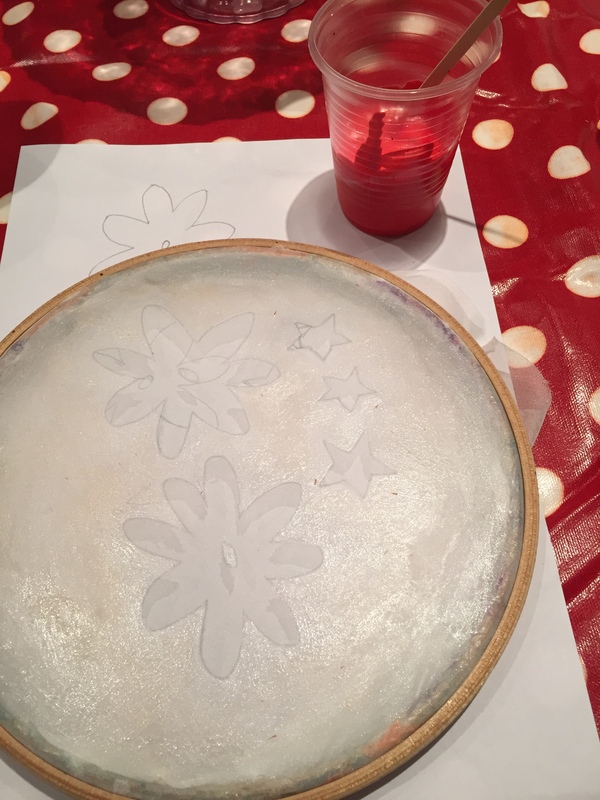 Using a paint brush, paint PVA glue on both sides of your fabric avoiding the areas where you want the paint. 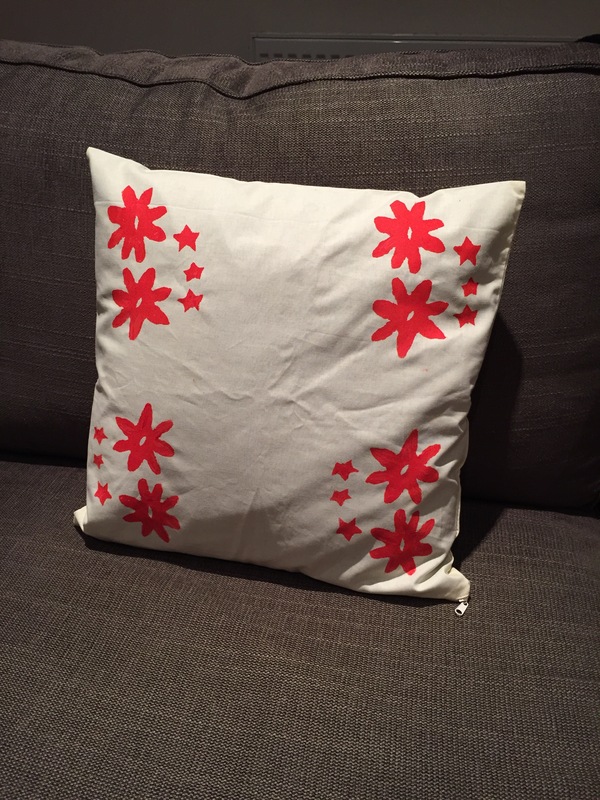 For example in my design, I painted around the flowers and stars. Make sure that you spread the glue evenly and avoid blobs as this can impact the quality of your print and of course will take much longer to dry. Once dry, it’s a good idea to do a test run on a spare piece of fabric to ensure that you’ll be happy with your final design and you’ve glued all the areas you need to. 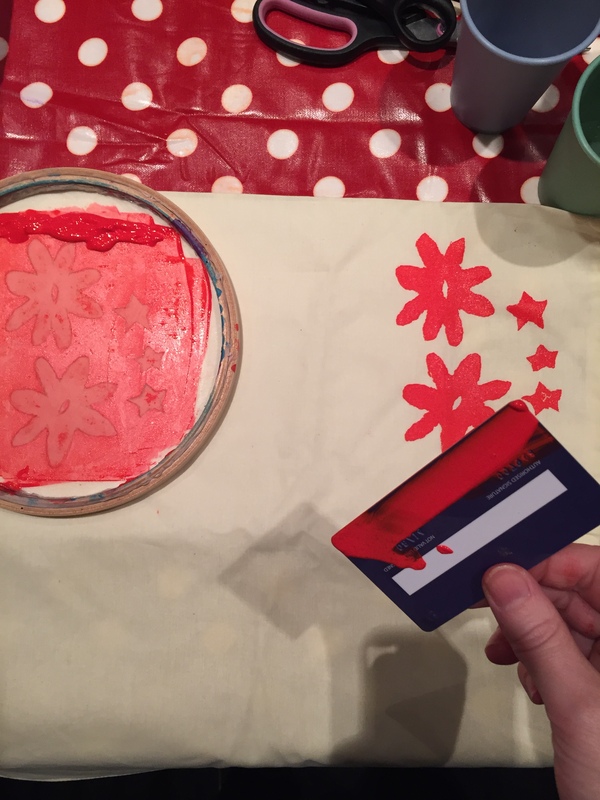 Using a screen filler and a screen printing/fabric paint, both of which you can purchase for around £10, mix around 2cm of each. If you have a large area/design to be painted then increase the amount of paint. Mix these up. Place the hoop face down on the fabric with the rim facing upwards. Spoon a line of paint onto the hoop at the top, about 2cm above where your design starts. Then using a fast sweeping motion, pull the paint down your design. Be sure not to bend the card or press too hard as this can cause the organza to tear, or sink too much ink onto the fabric you are screen printing. Once done, carefully lift the hoop from the fabric ensuring that you don’t smudge it. You may need someone to hold the fabric down whilst you do this depending on how complex your design is. If the design doesn’t work, work out where on the hoop extra glue needs to be added or you can use masking tape to cover up sections. You can also amend your design with a paint brush once completed so lots of quick fixes available. When your completely happy, do it for real on your main fabric and hey presto, you have yourself a very funky design. Good luck and please post your designs if you decide to make something. Any questions, I’ll be happy to help.